Cool Tools for Embroidery Fans! 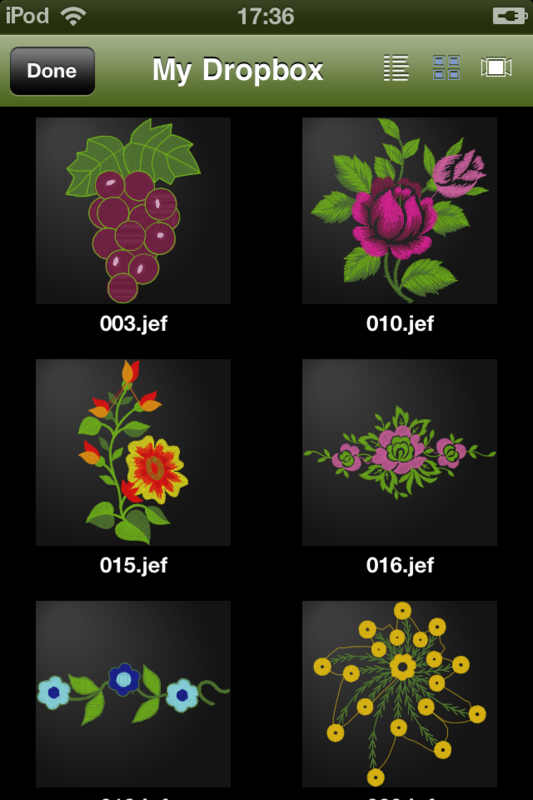 Would you like to display your embroidery design library in yout iPhone and iPad? Would you like to show your design collection on the road? 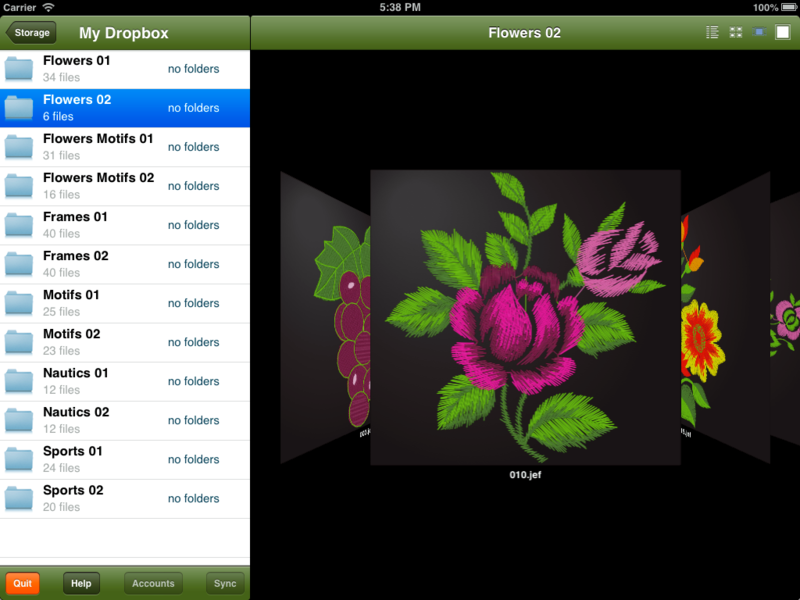 Now you can display your embroidery files library in your iPhone and iPad! Designs will be automatically organized in the same way your workstation is. Using DropBox (cloud storage service) you may synchronize your existing embroidery files stored in your computer with your iPhone or iPad. PE+Explorer can read several standard machine file formats (check compatibile formats), then you just need to move your files & folder into a DropBox folders and ask PE+Explorer (in your mobile device) to sinchronize. You don't need to previously convert or use any additional software to organize your library. 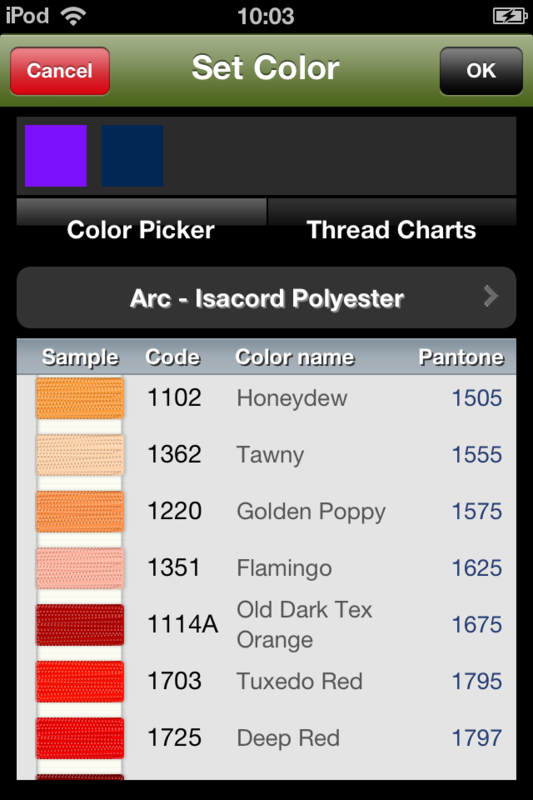 The synchronization downloads the embroidery library on your mobile device. 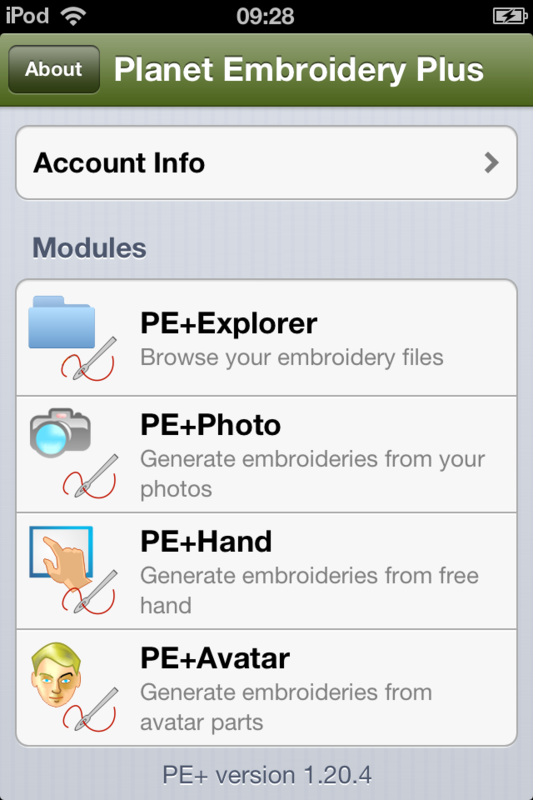 Then you will be able to browse folders and show the embroidery designs in several useful presentation modes. Note: PE+Explorer requires internet connection to run. PE+Explorer Express Edition is free. As with others PE+ modules, just download, install and use the free application, and then decide whether to get any charged module or not. You may fully try each application before purchasing it. How to use PE+ Explorer? Step by Step Guide. Is there a demo version or a trial period? Which is the difference between "Express" and "Standard" editions? Where to purchase P + Explorer? 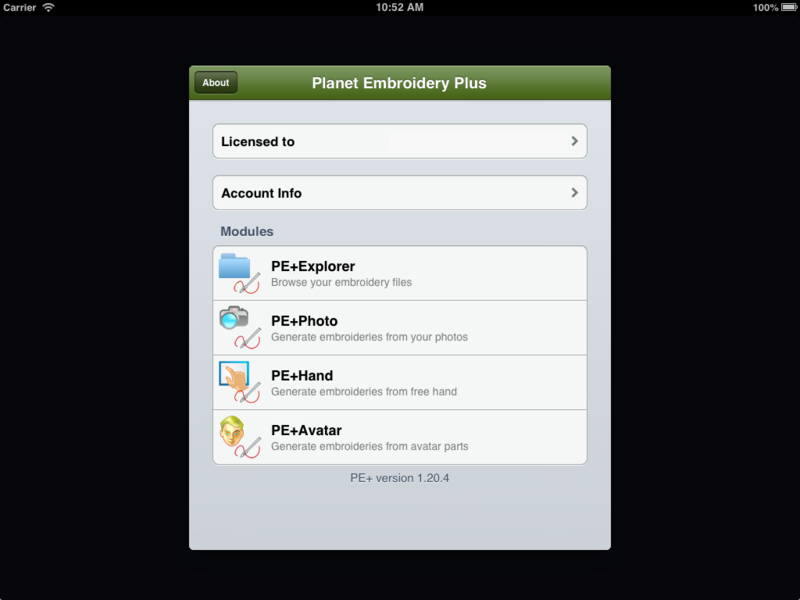 What is PE+ Explorer (planet embroidery plus, explorer module)? What is PE+ Explorer for? 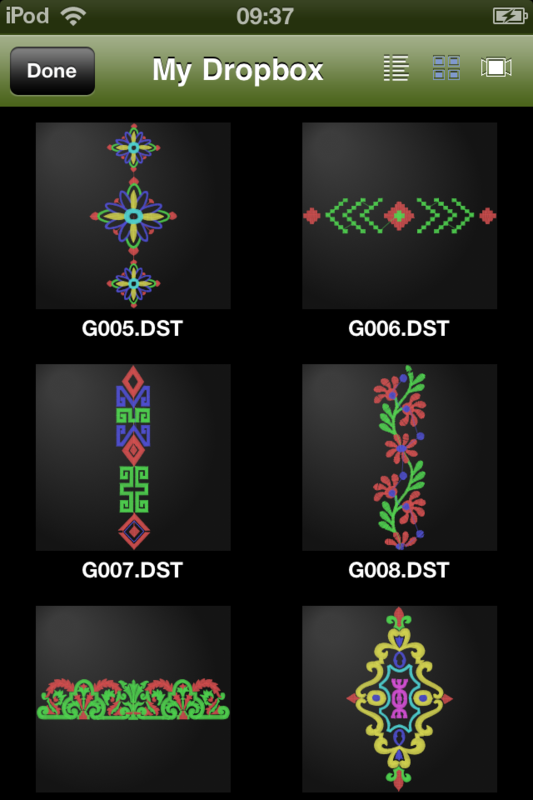 This is an application especially designed for mobile devices (iPhone and iPad initially) that graphically displays the embroidery designs user library. How designs are loaded on the devices? The program uses the DropBox service to synchronize embroidery files between computers and mobile devices. It is also possible to sync files through iTunes, but we recommend DropBox because the process is very simple. Install PE+ application on your mobile device. This application includes several modules, including PE+ Explorer (note: the newly installed modules will work in Standard mode for 1 month, after which they will work in Express mode or with limited functionality). If you do not have a DropBox account yet, just create a new account and get a lot of storage space in the cloud for free (see www.DropBox.com). You may then hire more space from DropBox (if required). You must install DropBox applications in each of the devices and computers you want to synchronize. Enter to the module PE+ Explorer, select the function �Accounts�, enable DropBox cloud storage service and login DropBox with your DropBox account data. The program will show DropBox account properties information. Confirm the action (Done). After associating your DropBox account with PE+ Explorer, the cloud storage service is listed in the left panel (Storage) of the mobile application At the same time, the mobile application has created a new folder inside DropBox (on the device, on the web, and on all computers associated with that DropBox account). Search that folder on the computer (My Dropbox> Apps> Planet Embroidery>). Copy your folders containing embroidery designs into that folder (embroidery files must be in embroidery machines expanded formats compatible with PE +). Wait until the moment the files copied into the DropBox folder are synchronized with the files stored in DropBox server (time may depend on the number of files, the size and internet connection quality). Now it is time to send the designs (from DropBox cloud service) to the device. In the PE+ Explorer application, select the �Sync� button to synchronize. We recommend synchronizing only embroidery compatible files (skip other unnecessary files). To continue press �Scan� in order to check files stored in DropBox and compare them with the files stored on the mobile device. If the program founds embroidery files that are not in the device, it will suggest to �Synchronize�. Do it. This process may take a long time if this is the first time you synchronize. Note: In some cases (with some frequency) the synchronization process may be interrupted. That's not a big problem. If that happens, simply retry the synchronization and the program will continue with the task. When finished, you will be able to browse folders stored on your device. Enter each available folder by pressing on the right side of the listed item (left panel) and change the design dragging on it. PE+ Explorer offers multiple views to present the design library (upper right corner of the program). As often as you prefer, you can synchronize the device again with the designs stored on your computer. Is there is a demo version or a trial period? When installing first PE+, most of the functionality of each module is available (at no charge) for a certain period of time (1 month, in most cases). You can use this time to use and to evaluate the program. After that time expires, the modules will run in Express mode, ie, some functionality will be limited. For some users, the Express mode functionality may be insufficient. The time for testing the full version cannot be extended (even reinstalling the app), so we suggest you use it from the moment of installation. Part of the functionality of PE+ Explorer is limited on the Express edition. The number of folders shown and the number of embroidery designs for each folder is limited. Some presentation views for the design library designs are unavailable in the PE+ Explorer Express edition. Where/How to purchase PE+ Explorer? 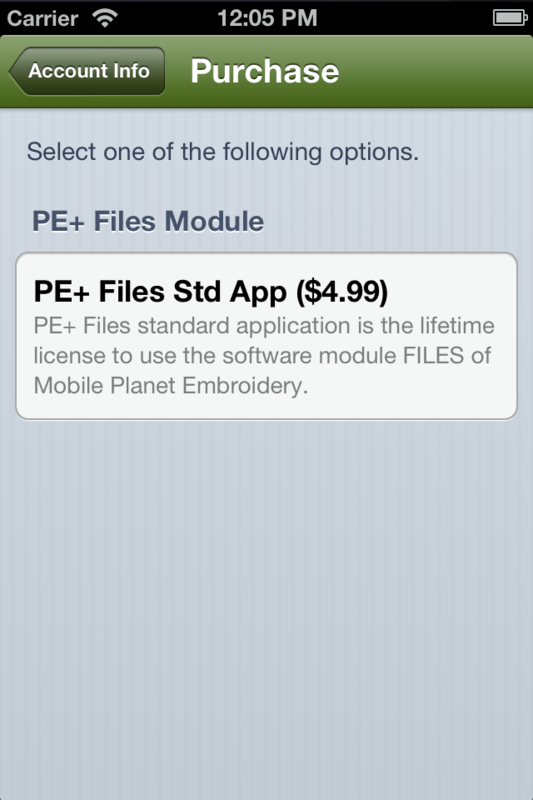 You can download and install PE+ for free from the Apple Store. If you want to purchase the Standard edition of PE+ Explorer, on the main menu of the application (where you select the programs / modules), select "Account Info" in order to buy any of the commercial modules (PE+ Explorer"). This samples are for testing purposes only. 2019 © planetembroidery.com :: All rights reserved.